‘Mark These Cradles,’ as seen at the Moghadam Gallery. Photo by Elijah Ndoumbé. 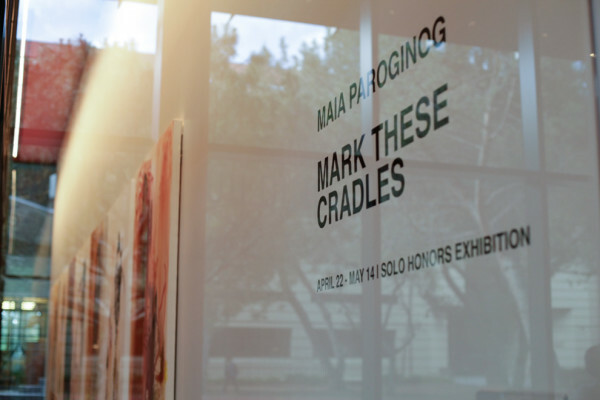 “Mark These Cradles,” currently on view at the McMurtry Building’s Moghadam Gallery, is a solo exhibition featuring the work of Studio Art major Maia Paroginog. 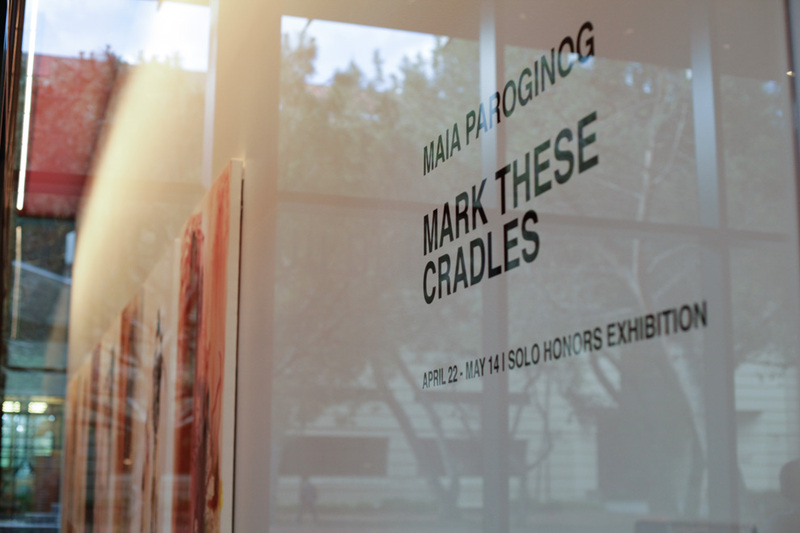 An opening reception for “Mark These Cradles” was held at the McMurtry Building on April 22. The exhibit is part of the Department of Art & Art History honors program, which allows students to further pursue an artistic field or idea in which they have prior experience and culminates in an on-campus solo exhibition. 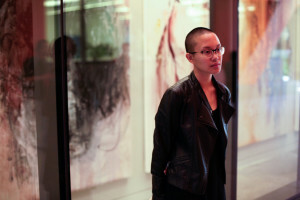 Eight lofty canvases, shielded behind the glass windows of the gallery space, comprise the show. Paroginog stands in front of their exhibition. Photo by Elijah Ndoumbé. A cursory glance at the exhibit reveals an incredible range and depth of emotion. Some paintings are mellow and wistful, with watered-down clouds of paint billowing across the white expanse of canvas; others are more brooding, heavy with clouds of black pigment. The exhibit is precluded by a display of Paroginog’s sketchbook, which reveals loose figurative work. The sketchbook is a place for smaller scale experimentation, indicating how Paroginog solves problems with regard to their paintings and their composition. Paroginog bases their abstractions and compositions on the body and placement of vital organs, tracing the contours of the human figure using a combination of paint and graphite. Paroginog’s artistic process and choice of media is meant to reflect the fragmentation of the human body. The body is stormy and ephemeral, much like the swirls and thick daubs of paint that seem to characterize “Mark These Cradles.” Traces of handprints can be seen smeared against canvas. Paint drips freely downward in a sort of controlled chaos. The employment of these different types of mark-making render the work intensely visceral and human. 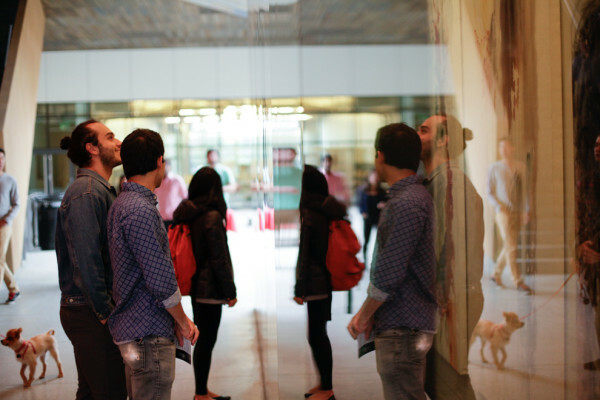 The reflective surface of the Moghadam Gallery becomes a part of the show. Photo by Elijah Ndoumbé. A distinguishing feature of Paroginog’s work is how the artist makes bold decisions with color. Deep crimson explosions of paint stand for blood and vitality. Complementary blue, orange, red and green hues clash for attention. Indeed, the idea of complements and contrasts unifies the pieces in the exhibit. Thick pigment is caked onto the canvas, overlaid onto translucent drips of water-diluted paint. Drips of color appear to crawl towards the bottom of each canvas, while shapes and conglomerates of color are arranged in such a way that they seem to be rising upwards. This clash of rising and falling creates a scintillating sense of tension, and the verticality of Paroginog’s compositions speaks to their experience with global and cultural hierarchies. Walking through the exhibit, I was frequently greeted by my own reflection in the glass surface of the Moghadam Gallery – my silhouette was gently mirrored in the canvases on display. In creating these works, Paroginog hopes to prompt viewers to consider their own bodies as landscape and as mediums for expression. “Mark These Cradles” is on view at the Moghadam Gallery until May 14, 2016. Contact Eric Huang at eyhuang@stanford.edu.